Financial problems and death haunted the owners of a World War I vintage aircraft that once flew – and fell – over northern Rhode Island. Photo courtesy of John F. Emin Jr.
Can an airplane be jinxed? Some would say the one in this story was, for bad luck seemed to follow it everywhere it went. Others don’t believe in such things. However, whether one calls it a jinx, a hex, a spell, a curse, or simply bad luck, one thing is certain; the negative energy connected with this aircraft didn’t end with its destruction. The ill fated aircraft was a World War I vintage Eaglebrook bi-plane, constructed of a wooden skeleton covered by a “doped” canvas skin; flimsy by today’s standards, and hopelessly obsolete even when it was still relatively new. It could transport a pilot and one passenger in two open cockpits set in tandem, each with flight controls so it could be flown from either the front or the back. The plane originally belonged to a Providence man who had several accidents with it. On one occasion, he managed to tear the convertible roof off his automobile when he caught the plane’s landing gear on it during what seemed like a perfect take-off. Some might say it was merely bad piloting skills, while others might say it was a harbinger of what was to come. The owner eventually put the plane in storage at Montgomery Field, a small airport once located in North Smithfield, where it sat for several years until it was sold in 1933 to a Woonsocket man who repaired and repainted it. The Department of Commerce certified it as airworthy and issued a registration certificate, #NC5081. The registration was later suspended after yet another accident. The new owner then fell into debt, and when he could no longer afford the hangar rent and storage fees, the plane was sold at auction where it was bought by 19 year-old Ralph Wilkins of Slatersville for $150. Wilkins brought the plane to Woonsocket Airport where he hoped to learn to fly. After some repairs, the plane’s registration was re-instated. When the original owner from Providence learned of the auction, he filed a lawsuit and obtained a court order for the plane to be returned to him. What claim he had to the aircraft is unclear, but after taking possession of it, he flew it to Hillsgrove Airport in Warwick and put it in storage there. Wilkins counter sued, and after much legal wrangling, eventually won the case, but incurred a certain amount of debt in the process. When the plane was returned to him, he had it brought to Smithfield Airport, which was located where Bryant University stands today. While the lawsuit was working its way through the courts, Wilkins began taking flying lessons from Herman Dolbeck, a Woonsocket businessman who operated his own florist shop, and was part owner of a corporation that sold personal airplanes. Dolbeck, a World War I veteran, owned his own airplane and was well known for flying over cemeteries on Memorial and Veteran’s Day dropping flowers. He loved to fly, but his wife was fearful of his hobby, and begged him to stop on more than one occasion. He had already survived one plane crash at What Cheer Airport in 1930, when the plane he was in hit some high tension wires on takeoff and went down in a swamp. Although relatively unhurt from the ordeal, he later commented to a friend that “some day” he expected to be seriously injured or killed in a plane crash. On the morning of May 28, 1934, Dolbeck met Wilkins at Smithfield Airport for flying lessons. 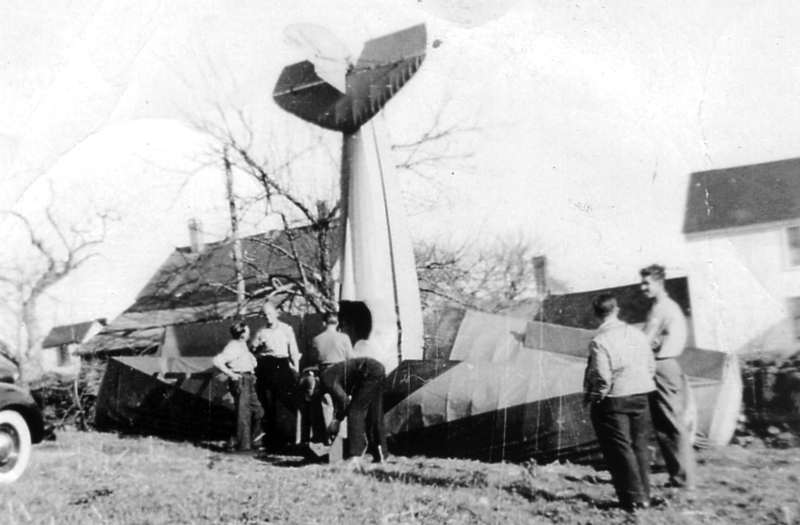 They took off in Dolbeck’s monoplane and after a few hours they landed at Woonsocket Airport where the monoplane was routinely kept. They then drove back to Smithfield Airport in Dolbeck’s car and parked in front of the hangar where Wilkins kept his airplane. It was now late in the afternoon and the men hadn’t planned to do any more flying that day, but just the same, they pulled Wilkins’ plane out and started the engine while they waited for Ralph’s father and brother to arrive to take him back to Slatersville. When they arrived, it happened Ralph’s father had a camera, and he took several snapshots of the two men with the plane. After some brief discussion, Wilkins and Dolbeck changed their minds about more flying, and decided to take the plane up for a quick test flight. A mechanic who had been present would later testify that the engine sounded good to him, but a pilot who witnessed what came next stated that the plane appeared “loggy and heavy” as it gained altitude. Exactly what happened next was never conclusively determined. The engine had been warming up for over 20 minutes and there was plenty of fuel in the tank. All that is known is that the plane managed to make half a circle around the airport before the motor sputtered and quit at an altitude of about 250 feet. The craft quickly lost altitude and crashed nose-first to the ground. Herman Dolbeck was killed instantly; Ralph Wilkins succumbed to his injuries a short time later. Since the plane was equipped with duel controls, it was never established who was flying it at the time of the crash. Word of the accident spread quickly, and state troopers had to rope off the area to keep the dozens of spectators at bay. Investigators from the Department of Commerce learned that the plane did not have its original engine, and the replacement was actually older than the aircraft itself. Therefore, engine failure was cited as the probable cause of the accident. Mr. Dolbeck’s funeral was held in Woonsocket with full military honors. Even though the “jinx” plane had been destroyed, its pall of bad luck continued when a woman standing next to the casket conversing with a member of the honor guard suddenly collapsed and died of a heart attack! On his way to St. Charles Cemetery and eternity, Mr. Dolbeck’s hearse was accompanied by a flower truck adorned with a large airplane made of hundreds of flowers. The wreckage of the ill fated Eaglebrook was hauled away, the remains of which may still lie buried in some landfill or old dump. Can an airplane be jinxed? This particular one had been involved in several accidents, one law suit, caused financial problems for its owners, and connected with three deaths. You decide.